Trans World Airlines was once the epitome of the classy, mid-century glory days for air travel, when Don Draper-types described flying as “civilized.” In 1962, Eero Saarinen designed an iconic, cutting-edge Jet Age TWA Flight Center in a JFK airport terminal that elevated the standard of what an airport terminal was expected to be -- it was declared a New York City landmark in 1994. In 2001, finally unable to keep up with the booming modern airline industry, TWA declared bankruptcy and was acquired by American Airlines, and the TWA Flight Center has been more or less been shuttered to the public ever since. That’s all about to change: At noon on February 14, guests can start booking reservations for the new TWA Hotel, which formally opens May 15. Act fast, though: The experience of snagging one of the 512 rooms will be reminiscent of the frantic page-refreshing you might associate with, say, tickets for Hamilton or Coachella. The original building will essentially be the new hotel’s command center, and wings have been added to accommodate the additional rooms, which start at $249/night and have been designed to match the original retro 1960s style, down to the vintage rotary phones. The TWA Hotel will feature six restaurants, eight bars, untold shops (stay tuned for the retailers and merchandise, to be announced within the next six or seven weeks), floor-to-ceiling windows with a view of the runways, a Jet Age museum, a 10,000-square-foot gym, a 10,000-square-foot rooftop observation deck and pool, coffee shops by Intelligentsia Coffee, a restaurant by legendary French-American chef Jean-Georges Vongerichten, and a handy airtrain to JFK terminals. The coup de grace is a decommissioned 1958 Lockheed Constellation airplane -- “Connie” -- the model that broke the transcontinental speed record in 1946, and in the 1950s served as President Dwight D. Eisenhower’s Air Force One. This particular plane, Connie N8083H, began flying TWA passengers in 1958 only to be replaced by a newer model just two years later. After a few more years as a TWA cargo plane and then as an Alaskan bush pilot plane, Connie N8083H was sold off for $150 and by the 1980s -- outfitted with a cargo door in her side for airdropping pallets of weed -- engaged in a brief, but illustrious, career as a drug-runner plane all over Latin America. After getting stuck in a ditch in Honduras and abandoned, she was eventually sold to another drug dealer back in the US who ended up going to prison for tax evasion. After landing at auction, Connie was ultimately restored with the original parts, and will now enjoy a new life as a cocktail lounge. The plane is one of only four remaining Connies of that model in existence today. 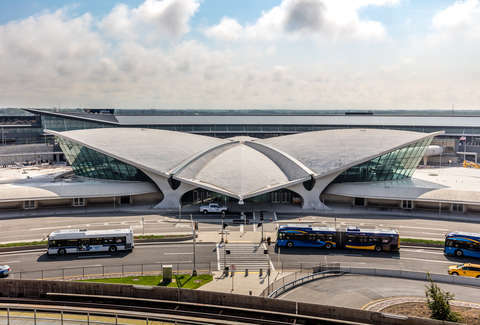 Construction, at its unusual intersection of historical preservation and airport regulations, has involved 22 government agencies, 178 different consulting firms, and more than 7,000 people working pretty much around the clock for the last four years. If you’re concerned about the noisiness that would seem to go along with sleeping next to a tarmac, don’t be. The hotel also will have the highest Sound Transmission Coefficient in the US -- meaning, it’s been soundproofed within an inch of its life. The five-inch-thick glass curtain wall is the second-thickest ever manufactured, surpassed only by the one at the US Embassy being built right now in London.